Our human history is rich with images and art from our ancestors across all cultures who practiced ceremonies and meditations using crystals clearly understanding their importance as tools for an enlightened humanity. We've taken this to the next level. Masters’ Crystals Coherence Meditation Crystals are uniquely created and were divinely inspired (there is no other possible explanation). We've combined the natural properties of pure quartz crystal, the power of sacred geometric shapes and embedded resonant frequencies and sounds resulting in the finest meditation crystals available anyhere else in the world. Coherence Crystals amplify your personal bio field resulting in a deeper meditation experience with effortless ease. Users report greater clarity, calmness, centeredness, balance, open energy channels (chakras and meridians) and numerous other synonyms describing the "coherence" of their field. A brief overview of how quartz crystal becomes a Masters' Crystal Coherence Brand crystal. All Masters' Crystals brands are based on the same creative principles. Quartz crystal is a solid body with a homogeneous repeatable internal structure. The basic atomic structural unit of quartz is a group of 3 connected Si04 tetrahedra organized as a three fold helical channel that runs parallel to the optical axis. This molecular structure is foundational to the piezoelectric and pyro-electric properties of quartz crystal. Each crystal begins as large pure quartz crystal grown (5-10kg) in a laboratory environment for control and cleanliness purposes. The computer storage and large optical lens applications are mostly responsible for developing this capability. It is the helical energy channels that transduce "aetheric" or "universal" energy into electro magnetic and gravitational energy which we humans can "feel" and experience. We delve into this subject in more detail on our Quartz Crystal Structure page. For purposes of this abstract, these helicial energy channels run parallel to the optical axis of quartz. Understanding this internal energetic alignment is critical to maximizing the energetic properties of quartz crystal. Masters' Crystal also fully utilizes the "empty" storage capabilities of pure quartz crystal much like a computer hard disk. The next component of our application is in the area of shape and the power that each shape contains. The shaping of crystals has been around for millennium and more specifically the geometric shaping based on the work of Plato, Theaetetus and Euclid who pioneered humanity's first documented exploration into mathematics, shape & their importance. This is the basis for the Coherence Crystal Tetrahedron shape - the foundational platonic solid geometry. Each large pure crystal slab is divided, shaped & polished, to exact specifications, using diamond saw blades and grinding wheels of increasingly finer grits. More information on shape and the power of shape is found on Shape Power page. The last component of our unique crystal application synthesis speaks to boosting or amplifying the natural properties of quartz crystal. Continuing the computer hard drive analogy from above, pure quartz crystal is relatively empty of data and information. When you purchase a new computer hard drive the BIOS (basic computer operating system) is pre loaded on it and 95+% of its capacity is allocated for user software and applications. So too with pure quartz crystal. Masters' Crystals utilizes its proprietary process for embedding (writing) information to quartz crystal (here is one reason why purity is so important). In fact, we completely fill the Coherence Crystal's "hard drive capability" to maximum for important reasons discussed in more detail on our Technology Application page. For our purposes, there are 3 primary classifications of quartz crystals – "Natural" (from the Earth) and "Lab Grown" Natural quartz, and synthetic Silica. Silica (Glass) is disregarded here because of its amorphous nature. Masters' Crystals is forever grateful to Amir Chossrow Akhavan of Hamburg, Germany, who authored and maintains the definitive web resource for understanding the structural, chemical and physical properties of quartz crystal. The Quartz Page, found on our Links page will direct you to Amir’s 31 pages on quartz structure and 19 pages on physical properties. Even the most non-physics oriented mind can be transported to a clear understanding of why quartz crystal is relevant to and interacts with our human ascension process at this time. This abstract highlights relevant passages "The Quartz Page" to facilitate a high level understanding overview for our discussion purposes here. A crystal is a solid body with a homogeneous regular internal structure. It is built up by a periodic repetition of basic elements. Additionally, a very distinctive feature of quartz crystal structure is the presence of channels that run through the entire crystal parallel to the c-axis. Quartz crystal is said to have a macromolecular structure. An ideal quartz crystal is one large molecule. A model of an isolated SiO4 group that seems to be the building block of quartz (Fig. below left). The 4 oxygen atoms that surround the silicon atom form the corners of a tetrahedron. Because of its shape, the SiO4 – group is called a SiO4 tetrahedron (plural: tetrahedra). Each oxygen atom has the same distance to the silicon atom, and the distances between the oxygen atoms are also all the same. The basic structural unit of quartz is a group of three connected SiO4 tetrahedra. The chemical formula of the basic structural unit of quartz is Si3O6. In quartz SiO4 tetrahedra are arranged in virtual threefold helices that run parallel to the c-axis. Each SiO4 tetrahedron is member of two virtual helices of the same handedness, but of opposite polarity. Because each SiO4 tetrahedron is a member of two helices of opposite polarity, this larger crystal structure is not polar as a whole due to this balance. This balance, that is present throughout the expanding growth scale, is apparent in the diagram below where the sixfold double helix and the threefold helices reflect the opposite handedness. This is IMPORTANT to the understanding of how crystals exist in a “ready state” until another field is present and then amplify that biofield. Lab Grown Natural Quartz Crystal comes to us from growing demands for pure quartz applications in the Medical, Aerospace, Large Optical and Computer industries. We can thank Marcel Vogel, former IBM scientist, as the face of this modern revolution regarding crystals. Marcel also clearly understood the meta physical properties of quartz crystals and devoted his life to this mission after leaving IBM. Many videos exist on YouTube for those interested in learning more about Marcel and his work, especially the development of the Vogel Crystal. See our Links page for specific video links. Lab Grown Quartz is made from a 1 mm sheet of quartz (seed plane) with 2 electrical connections suspended in air (see colored rough photo below for visual on seed plane). Under clean lab conditions with electrical stimulation, high pressure and high temperature, quartz crystal grows more rapidly than in nature and with no contaminants or fractures resulting in a purity not found in Natural quartz crystals found in Earth. This leaves the energy channels (helices) unimpeded and available for optimal performance. Equally important is the relative emptiness of the Lab Grown quartz crystal. Remembering our computer hard drive analogy discussion in the Coherence Meditation Crystals page, Lab Grown Quartz Crystal is like a hard drive that has the BIOS loaded but no operating system or added software applications. A close inspection of the 1st two photographs below of Lab Growth Quartz shows the helical vortices that mark the “c” axis growth of natural quartz. Notice the energy patterns in the quartz – almost like the rings of a tree marking the tree’s growth. Lab Grown quartz crystal that is colored occurs when minute amounts of other elements are introduced to the growing process. From everything we've been able to learn about "colored" Lab Grown quartz crystal, the trace mineral/element amounts do not interfere in any way with the properties or behavioral characteristics of quartz crystal. Siberian Blue adds cobalt. Emerald Green adds copper. Citrine adds iron. Lab Grown smokey quartz and amethyst are not suitable for our purposes. Some of you will be old enough to remember an explosion in the 1970′s mainstream media when Kirlian photography, pyramidal shape power and other matters esoteric came to the forefront of everyday conversation. Human interest in geometric shapes has bubbled to the surface of mankind’s consciousness at various times in history. We are currently experiencing another surge in shape discussion. We limit our conversation here specifically to the topic of shaping quartz crystal. 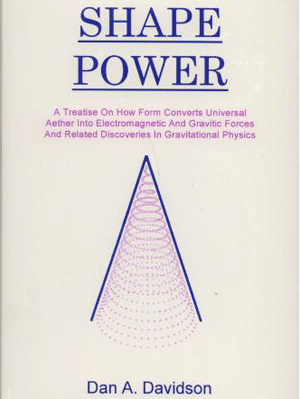 Dan A. Davidson in 1997 published his book “Shape Power” as a treatise on how form converts aetheric (universal) energy into electromagnetic and gravitic forces. Building on the work by Keely, Parr, Reich and others, Dan brought forward into mainstream conversation his research, experiments and conclusions on a wide variety of energetic topics all of which are relevant today. Dan’s book is out of print now but used copies can be found on Amazon. Dan not only presented and demonstrated how the geometric shape focuses aetheric energy and creates vortices in space but extended the conversation specifically to crystals. “The same converging lines present in geometric shapes (pyramids and tetrahedrons being the most powerful), which is intrinsic to crystalline shapes, are present in crystals from the macro level on down to the atomic realm. The atomic lattice structure of crystals makes them natural transducers of aetheric force and their exterior shape also lends itself to shape power physics”. “Crystal lattices are ideal for aetheric energy concentration as they are repeating motifs of geometrical line structures and helical channels”. Dan also introduces the idea of crystal arrays and their stronger energy patterns and outputs. This is congruent to the current conversation surrounding the 64 tetrahedron shape as the geometric building block of the universe (Nassim Haramein, The Black Whole, DVD). Nassim puts forth this shape in a logical straight forward manner tying mathematics, science and cultural history spanning the millennium into “The Unified Field Theory” which marries Einstein’s relativistic theories with the more recent quantum theories into a coherent treatise. Masters’ Crystals is privileged to join this evolving conversation and add to the existing body of knowledge for the betterment of all. It is our sincere desire to share what we've learned about quartz crystal and our application to everyone else exploring other quartz crystal applications. For instance, orienting the internal molecular structure of quartz crystalin a correct alignment with its external shape is critical to improving the effectiveness and efficiency of all crystal applications. Masters’ Crystals uses a unique proprietary process to enhance the functional characteristics and energetic properties naturally existing in quartz crystal. We address two subject areas in this conversation. Quartz Crystal as a storage device. Quartz crystal has outstanding storage capacity for information (light, vibration & sound). The computer industry is currently investing significant time and money investigating this fact and its possible benefits. Master's Crystal utilizes its state of the art technology to write (embed) information into its Coherence Crystals. Our scalar generators create a carrier wave and field powerful enough to penetrate through quartz crystal permanently storing our programs of frequencies, vibrations and sounds. These frequencies and sounds act like tuning forks to all the different aspects of our human bio field. Every part of our human being has a frequency(s) whether it's our liver, toe, hair, emotions, thoughts and so on. And, everything we observe and experience, both internally and externally, consists of light, sound and vibration. Coherence Crystals are the ultimate tuning forks for "raising our frequency". And, as is true with tuning forks, only resonances in proximity to the same vibration will respond and harmonize. Masters’ Crystals, after much research and experimentation, has selected a broad spectrum of frequencies and sounds that support coherence in the human bio field, hence its name “Coherence Crystal”. One only needs to look at before and after auro photographs or pip photographs to see the dramatic differences in the human energy field. We completely fill all our crystals and pendants to capacity with our "Coherence" information (frequencies, vibration and sound). The benefit here is that our crystals never need to be cleared. Quartz Crystal as a transducer of Aetheric Energy. We know that the internal molecular structure of quartz crystal has a foundational capability to transduce universal energy into a form of energy that we can experience. We also know that quartz crystal exists in a "ready but neutral" energetic state because of its opposite helical polarities. In addition to embedding frequencies and sounds, an our technology amplifies the already present energy vortex in each crystal and increases the "speed of the spin". Think of this vortex like a mini-tornado that spins very rapidly and tightly around an axis. In Masters’ Crystals we mark this axis on one of the tetrahedral truncations so that each user can properly align the crystal vortex with their own energy vortices (Chakras) for a more beneficial experience. We are able to completely saturate our crystal forms with our powerful scalar generators which create a “ready state amplifier” in each crystal. When our crystals come in contact with a bio field they immediately go from “ready state” to calibration, harmonization and amplification. And, once removed from a bio field immediately return to ready state. This is why Masters’ Crystals never need “clearing”. Win the chance for the trip of a lifetime!